Buckingham Shum, S. and Deakin Crick, R., Learning Dispositions and Transferable Competencies: Pedagogy, Modelling and Learning Analytics. Proc. 2nd International Conference on Learning Analytics & Knowledge (Vancouver, 29 Apr-2 May, 2012). ACM: New York. pp.92-101. DOI: http://dx.doi.org/10.1145/2330601.2330629 Eprint: http://oro.open.ac.uk/32823. The most recent work on this, which picks up the challenge identified at the end of the above paper, is the question of whether it is possible to generate an ELLI profile automatically from learners’ incidental data traces. 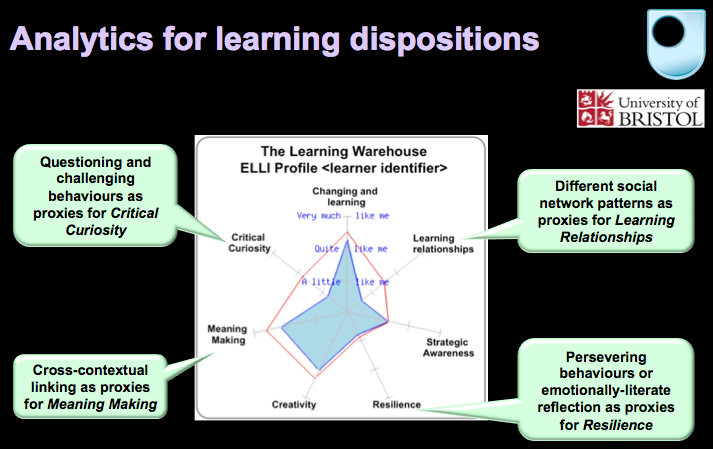 Shaofu Huang summarised the concept and work-in-progress on this at a recent SocialLearn symposium. We now have modest funds available to appoint either a visiting researcher or consultant to work with us at the Open University on a short, focused project, to design and run the database queries on the SocialLearn platform, which will enable us to begin testing the modelling that we have been doing. 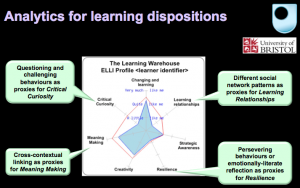 Previous Previous post: 10 years to wrestle with complexity + learning?